Home Events IPL - Indian Premier League 2019 IPL 2019 MI vs KXIP Highlights | Mumbai Indians Go Third! It was always going to be a tough IPL 2019 contest between the two in-form teams – Mumbai Indians and Kings XI Punjab. And the fixture did live up to its expectation as Joseph Alzarri dramatically scored 2 off the last ball to hand MI a slender 3-wicket victory. KL Rahul’s blazing 100* was overshadowed by Kieron Pollard’s 83-run masterstroke off just 31 deliveries. MI’s reward for chasing the massive target of 197 was the third position in the league table. Kieron Pollard had been widely criticized for his performances at the start of the season by many including us. After all, the West Indian had mustered up only 50 runs in the first four games. However, while the fans demanded his removal from the team, the MI decision-makers stood with their decision of fielding him and were rightfully rewarded. In his last match against SRH, Pollard (43* from 26 balls) single-handedly carried his team to a respectable total of 136. Mumbai would then go on to bowl out Hyderabad for 96 to win the contest. He was again in his elements against KXIP. This time though, he had an added responsibility of captaining the team in absence of Rohit Sharma. Like in Hyderabad, as the team kept on losing wickets on regular intervals, it was Pollard who stuck to his guns. He hit it hard when needed and his partnerships with Hardik Pandya and Alzarri Joseph would provide decisive. Pollard almost got it done by hitting a six (off a no-ball) followed by a four in the final over to take MI to a stage where they needed 4 from 4. With what was on display tonight, it feels that Kieron Pollard can go onto become one of Mumbai Indians’ most crucial part this season. Like Pollard, KL Rahul too didn’t have a great outing at the start of the season, having been dismissed for 1 run in the two opening matches. It seemed that the infamous controversy including him and Hardik Pandya was had taken a toll on the player’s performances. However, fast forward to the league’s 24th match, and Rahul is already in the second position in the race for the Orange cap with 317 runs. He gave a man of the match performance against SRH, hitting 73* off 53 in KXIP’s successful chase. The 26-year-old again repeated the feat against Mumbai and scored an inspiring century to help his team reach a massive total of 198. It would have almost been enough, had the Kings been able to defend it in the last over. It is important to note that this comes at a crucial juncture of time when the BCCI is expected to announce the squad for the 2019 ICC World Cup. IPL a headache for Virat Kohli and National Selectors? India’s national selectors as well as skipper Virat Kohli will be following IPL with bated breath as news of injuries to elite players keep on flowing. First it was Jasprit Bumrah who sustained a shoulder injury in the MI’s first match itself. Fortunately, the damage was minimal and Bumrah again returned to the playing XI against RCB, much to the dismay of the national officials. The pacer suffered another massive injury scare when he hit just below his eye after mistiming a catch during training on the eve of Mumbai Indians’ home game against Chennai Super Kings. Then MI skipper Rohit Sharma appeared to have pulled his muscle in the training session at the Wankhede Stadium ahead of Tuesday’s match against KXIP. 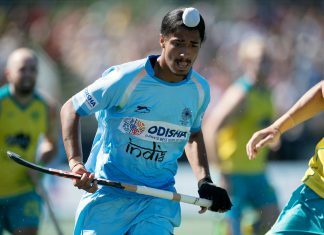 The Indian opener went down writhing in pain as the team physiotherapist Nitin Patel rushed for his aid. As expected, Sharma missed the IPL fixture against KXIP for the first time in 11 years. His absence presents a fresh blow to the Indian national camp. Nonetheless, Rohit Sharma’s injury again provides fire to the blazing debate on whether to let the elite player compete in the private competitions just before crucial events like the World Cup. While skipper Virat Kohli has been vocal about providing ample rest to the star players before the competition begins, other share a different view. The moment of the match has to be Chris Gayle marauding knock of 6,6,4,6 off Jason Behrendorff. That was another cold, vintage Chris Gayle knock, reminiscent that even at 39, he still has the firepower left in him. A couple of poor overs towards the end ill-conceived field placing for last couple of deliveries cost Punjab dear. But great match! Kieron Pollard is tonight’s player of the match, handsdown.